Siamese twin brothers Donnie and Ronnie Galyon, 60, are joined at the torso; they have four arms and four legs and separate hearts and stomachs - setting the world record for the oldest living male conjoined twins. 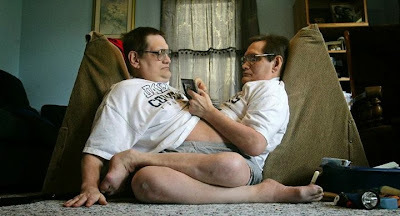 Born in Dayton, Ohio on October 28, 1951, the brothers, joined from the sternum to the groin, were delivered vaginally. .....According to Ward Hall, the twins' mother rejected them when they were born, leaving them to be raised by their father, Wesley, and later stepmother Mary. For the first two years of their lives, the twins were in and out of hospitals while doctors attempted to determine whether or not the twins could be separated. Because they share a single set of male organs, doctors decided that it was best not to separate them. They learned to walk at the age of 29 months. Though Mr Galyon initially vowed his sons would never be put on exhibition, he found himself with medical bills that he could not pay otherwise. The twins were exhibited in an air-conditioned trailer for most of their show careers, where they lounged about watching television while spectators peered in the window at them. The 1988 book Psychological Profiles of Conjoined Twins by J. David Smith discusses some of the in-depth tests conducted on the brothers, determining that, although their IQs are in the average range, they seem much slower due to lack of an education. They also have battled anger problems since an early age and have occasionally gotten into fist fights over the years. At the age of 14, one twin broke his foot after kicking a trailer in a fit of anger. They are now retired from show business and living in Ohio, though are careful not to mention exactly where, since in the past they have been victims of harassment, vandalism and even threats. They bought their own house with their earnings and are quite proud of it.